We have been controlling pests for over 12 years. We can arrange Building Inspections to be done at the same time as the Pre Purchase Inspection, both save you the time and money. 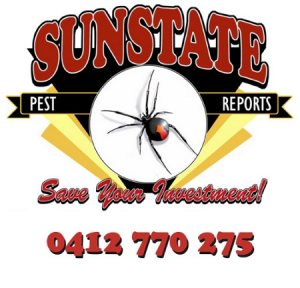 Sun State Pest Reports provides a friendly and professional pest control service, with their highly qualified trained technicians who only use chemicals that are have been approved by the Health Department and are environmentally friendly, complying to all Australian Regulations. Sunstate Pest Reports are a licensed, registered and insured inspection company with a wealth of experience in the Pest Inspection industry. We place an importance on providing an easy to understand, reader friendly report system. All our reports include digital photos that highlight any significant aspects of the inspection. We use the latest advanced termite detection equipment. All clients are encouraged to be onsite. We offer the Most Comprehensive Reports and a Prompt, Reliable & Professional Service.